In our previous blog, “The ABC’s of Braille Literacy,” we learned the most important terminology surrounding Braille. In this blog, we’ll take a look at the modern usage of Braille. How is Braille Accessed Today? Blind and low vision individuals read and write Braille in a variety of ways, from the original “slate-and-stylus” to modern personal data assistants. Technology continues to provide new ways to read and write Braille, making the written word accessible. Most people think of Braille as solely something printed, whether on a sign or on paper. 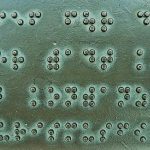 In our prior blog, we discussed the various options for printing Braille on paper, which remains a very common way to read Braille. But just as technology has offered ever-increasing text-to-voice options, it has also delivered the refreshable Braille display. A refreshable Braille display is a bit like a tablet or phone. 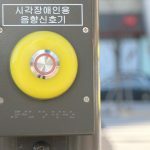 It has a screen that can display up to 80 Braille cells that change continuously as the user moves the cursor around the screen. For example, these displays are frequently positioned on the user’s desk, often underneath the computer keyboard. More portable versions connect to computers or smart phones via USB or Bluetooth connection. And Braille is not just for reading. Braille-literate individuals also have tools available to write in Braille. The most common include the slate and styles and the Braille writer. The Braille slate and stylus is to Braille what a pen/pencil and paper is for a sighted individual. The slate has a top and bottom between which the Braille writer places a sheet of thick paper. The top includes a grid of cells. The bottom includes indents for each of the six possible dots in each of the Braille cells. The writer uses a metal-tipped stylus to press the dots in each cell to emboss the Braille into the paper. Watch the American Foundation for the Blind’s demonstration video here. A second option is a Braille writer or Brailler. This device looks a bit like a typewriter and allows the individual to emboss Braille cells by striking keys corresponding with each dot within a Braille cell. Finally, Braille keyboards combined with text-to-audio technology and/or a refreshable Braille display allow blind and low vision individuals to type and edit electronically. Also available are small-volume Braille printers, which allow Braille readers to print and read their own work. In today’s technologically-advanced society, Braille remains an important literacy tool for the blind and visually impaired. Whether embossed on paper or read through refreshable-screen electronic Braille readers, reading and writing in Braille is the functional equivalent of reading and writing in text for the sighted person. While the blind and low vision community has access to more audio options than ever before, these can’t substitute for the written word in all cases. Read and understand a spreadsheet. Imagine an audio version of a spreadsheet that shows the date, time, location, and description of a series of events. “Cell A-1, Heading, Date,” “Cell B-1, Heading, Time,” “Cell C-1, Heading, Location,” Cell D-1, Heading, Description,” Cell A-2, January 30, 2019,” Cell B-2, 1 p.m.,” Cell C-2, “Montgomery County Public Library, Downtown Dayton Branch,” “Cell C-3, Kick-off meeting to discuss new series on the importance of Braille literacy for elementary school children.” By the time the reader gets to the fourth or fifth line, could you remember the information from the first line? Braille can be presented in a formatted fashion, allowing Braille readers to read not only the content, but also understand its structure. Read and understand a bar graph, pie chart, or similar graphic. The essence of a graph or chart is to show the relationships between and among information. A simple reading of the graph or chart won’t show that. But reading it in Braille allows the blind or low vision individual to grasp the interdependencies and comparisons. With a Braille slate and stylus, a Braille-literate individual can solve such an equation by hand in much the same fashion as a sighted-individual. Navigate a building. 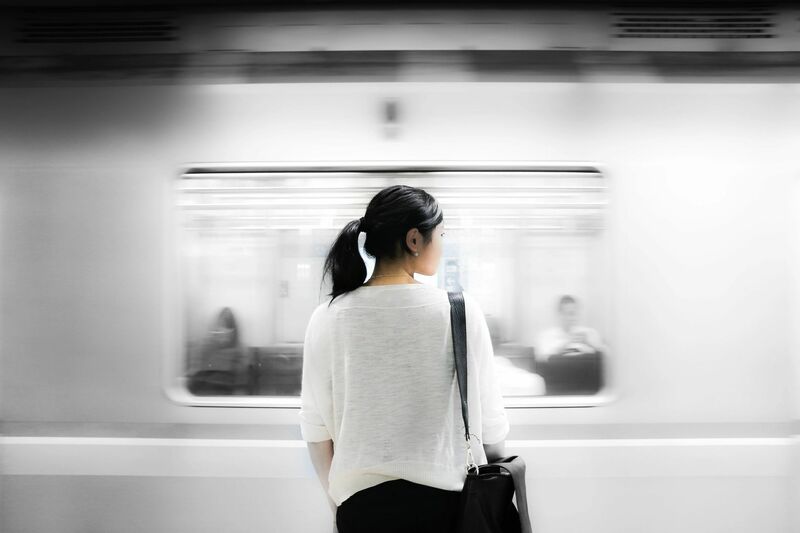 Could you find your way to a specific office within an office complex or store within a shopping mall if you couldn’t read the signs, the numbers on the elevators, and the like? Braille helps blind and low-vision individuals navigate independently. Cook a meal. Cans, boxes, and bags don’t come with audio buttons letting you know their contents. To avoid a tuna and apple pie filling casserole, Braille label makers allow blind and low vision consumers to label their groceries as they buy them (typically with the assistance of a sighted shopper or store employee). Braille labels are also a common tactic for things like DVDs, medicine, household cleaners, and other household objects. Braille is used today in the above contexts along with many others, from textbooks to menus to legal paperwork and beyond. In our next blog, we’ll delve into the federal and state laws that require offering Braille accessibility for blind and low vision individuals. Here at Vocalink Global, we offer Braille transcription and printing services. Connect with us today for more information! The Nemeth Braille Code for Mathematics and Science Notation, 1972 Revision, Compiled under the Authority of the American Association of Workers for the Blind, Association for Education of the Visually Handicapped, and the National Braille Association, available online at http://www.brailleauthority.org/mathscience/math-science.html#chem.